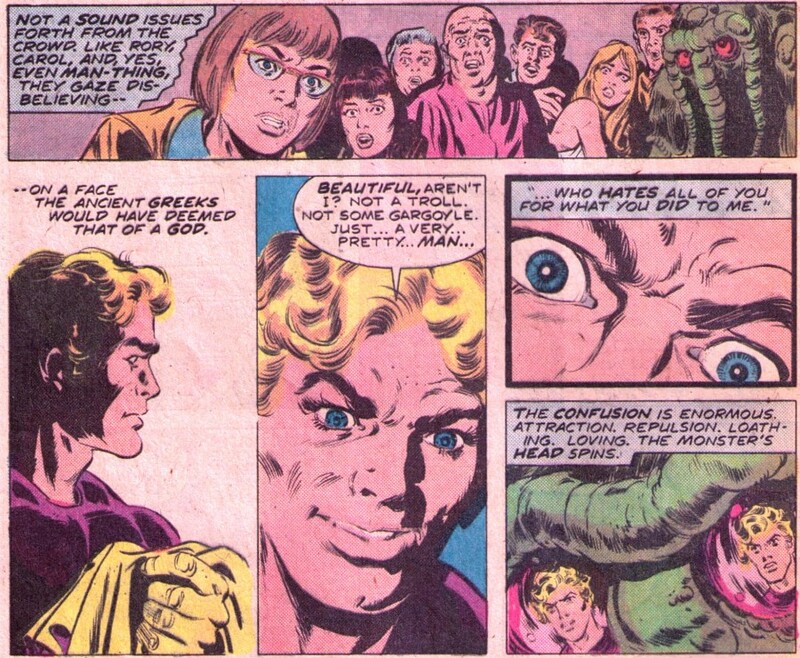 NOTE: This is the fifth part of a multi-part series of posts examining Steve Gerber’s final arc on the 1970s Man-Thing series. If you prefer to start from the beginning, you can go to Part 1 here. With Man-Thing #19 (cover date July 1975), Gerber begins to chart a rather bold new course for the strip. At the same time, we know as readers looking back almost forty years later that this Man-Thing series is going to end with issue #22. Among the more interesting questions here, at least for me, is when was the decision made to cancel the book and why. Tangentially related, and also of great interest, is when did Gerber himself know it was ending and how involved was he in the decision to end it. FOOM: The entire series of Man-Thing seems to be progressing. Do you have, somewhere in your mind, a final Man-Thing story, a final goal. Or for Richard Rory. So right off the bat we know Gerber’s planned five-issue arc wasn’t to be, as there were just four issues left in the series. Some of the other things he mentioned above would also not come to pass—perhaps as a result of the cancellation, perhaps not. But we’ll save the specifics for later. For now, there are at least a few more issues of greatness for us to savor. We kick things off in medias res, a technique that’s quite effective here. The previous issue ended with Richard Rory, Carol Selby, and Man-Thing set to leave Citrusville behind, while this issue opens with the Man-Thing walking the streets of some unknown, suburban neighborhood late at night. How did Manny end up here? This is just the first of several intriguing mysteries that are about to be introduced. Manny stops outside a house where a woman named Colleen Sanders is preparing to leave her husband (Paul) and their two sons (Mark and Chris) as they sleep. Gerber takes us inside Colleen’s head and we hear an imagined conversation with her husband. It’s a circular argument, with Paul basically asking “why” over and over and Colleen having no real answer for him. Gerber—who was at least separated at this point, if not formally divorced—does powerful work in this sequence, drawing (I assume) from deeply personal experience. 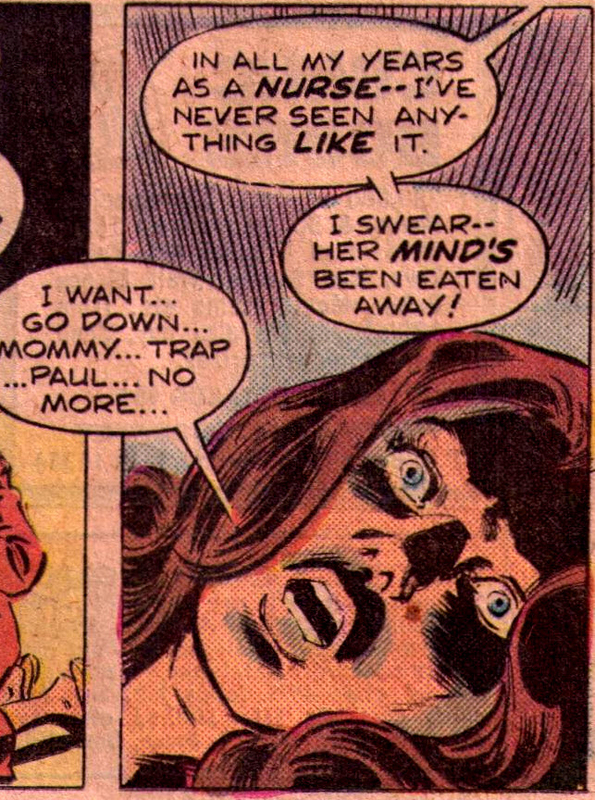 He presses his mouth to hers but the Man-Thing pulls him off. Man and beast then begin to grapple. Several neighbors are drawn outside by the sound of the car crash, causing the villain to break away from the Man-Thing and fly off. The Man-Thing then exits after one of the neighbors fires at him with a handgun. The neighbors then finally turn their attention to Colleen, only to find her in some kind of bizarre, vegetative state. Cut to a nearby motel parking lot off I-75, just south of Atlanta, where Richard Rory discovers that the Man-Thing is no longer in the van where he left him. Once again, Rory provides us with welcome comic relief as, in his panic, he begins calling out, “Man-Thing! Uh… here, Man-Thing! Manny! C’mon, Boy!” After realizing “this is stupid,” he runs back into the motel to let Carol Selby know that Manny’s gone missing, As he does so, we get a flashback that fills in the blanks of the previous thirteen hours. Feeding off your body’s own recycled waste? Ewwww! They try to coax the Man-Thing out again when they reach the Okefenokee; still no dice. Finally they stop at this motel in Atlanta and just leave Manny in the van for the night. Obviously, Manny had other ideas and decided to let himself out at some point. Now Rory is knocking on Carol’s door to let her know what’s happened. They need to call the police, he says, but first they need to call Carol’s parents to let them know she’s alright. Carol says they can’t do that. Rory wants to know why. She informs him that she’s actually just seventeen years old. Cut to our villain, the “Scavenger,” flying over downtown Atlanta, still on the hunt. He crashes through the front window of a donut store, seizes a waitress named Millicent Godfrey, and kisses her. The consequences of this act are a bit startling. The scream comes from the front lobby—Man-Thing has just found his way “home.” The desk clerk is so terrified that Manny’s on the verge of giving him the burn treatment when Rory stops him. To the amazement of the clerk and other motel residents present, Rory seems able to control the Man-Thing. Just as he’s about to coax the beast back outside, however, we have a party crasher in the form of the Scavenger, who literally comes crashing through the front-lobby window. The Scavenger comes in ranting at the Man-Thing like a madman. One is left with the impression that Millicent Godfrey was somehow a much less satisfying “meal” for him than Colleen Sanders would have been. At one point he even lifts the Man-Thing above his head before throwing him down to the floor. Rory tries to whack him with an ashtray stand from behind, but Scavenger spins around, knocks the makeshift weapon from his hands and tosses him aside. Returning to his rage, Scavenger leaps back at the Man-Thing, only this time he’s the one thrown to the floor. Scavenger is suddenly disoriented; confused. He begins scrambling to find his discarded cowl, mumbling, “Where is it? Must hide my face to be strong…!” He begins to feel fear, and you know what that means by now, I hope. Let’s sing it all together, kids: Whatever knows fear—BURNS at the Man-Thing’s touch!! And so it ends, with Scavenger holding his face with both hands, smoke wafting up between his fingers as the residents of the motel look on in horror and shock. In this issue’s flashback, it does reveal that Man-Thing killed the Mad Viking in the previous issue, but it doesn’t get very specific regarding how Manny survived that bath in the primary vat of the sewage treatment plant. I don’t think I found the answer to this mystery until I actually got my hands on issue #18 (which I believe was circa ‘82-’83 at the old, original Quality Comics store in Somerville, New Jersey). But the mystery of the Scavenger that began here was so damn gripping it didn’t really bother me all that much. I firmly believe this tale was originally meant to be part a much larger, more epic puzzle that could have been breath taking had circumstances allowed Gerber to assemble it for us. What we ended up getting is still pretty damn good though. To Boldly Go Where No Man-Thing Has Gone Before! I mentioned Gerber’s “bold new course for the strip” earlier. What I was referring to was the decision to take Man-Thing out of the swamp. It was a dangerous gamble because I’m not sure how the character works outside the swamp—and perhaps it would not have worked over the long term, but it sure went over like gangbusters in this issue. One aspect that helps the story (at least it helped a lot for me when I first read it as a kid) is that the Scavenger at least has the look of a traditional comic-book supervillain. 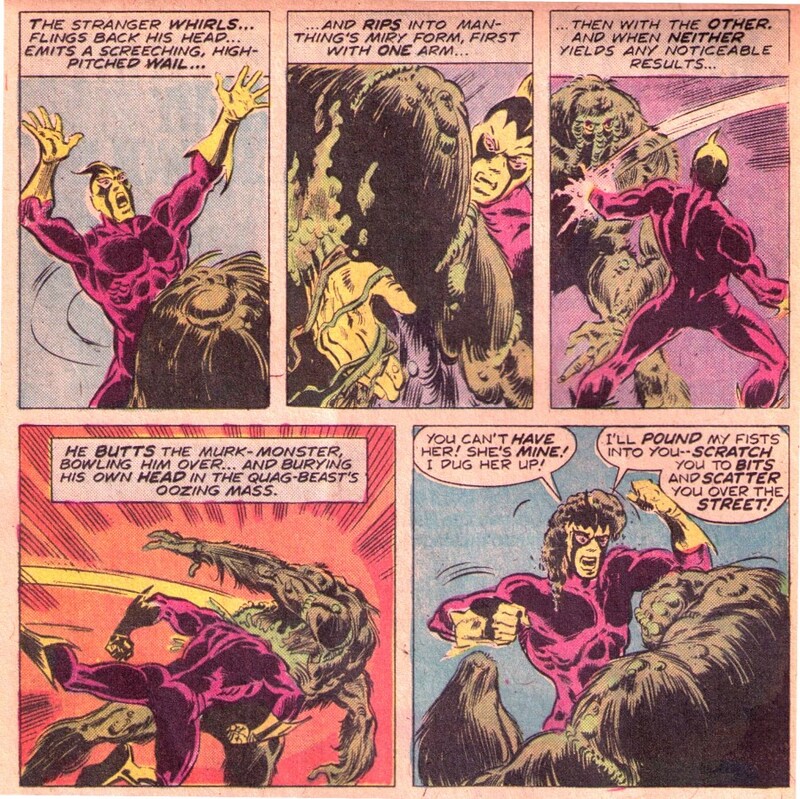 He also engages the Man-Thing in superhero-style fisticuffs in two different scenes. This helps give things a more traditional comics feel, even if the story is, at its core, anything but your traditional comic book. The Rory kidnapping twist also comes as a great surprise, while at the same time being a perfectly logical one, and Gerber gets a lot of comedic mileage out of the situation. Once again, Richard Rory’s comic relief overall this issue is both welcome and sorely needed. Just imagine how dark a story this would have been without him. And then there’s Jim Mooney. As I’ve discussed, Mooney made his reputation at DC in the 60s drawing Supergirl and Tommy Tomorrow, but he also did do a few House of Mystery stories back then as well. His versatility as an artist is reaffirmed here with that macabre scene of Millicent Godfrey being reduced to a skeleton. Another great job by Mr. Mooney. As you’ve probably realized. Steve and Jim are off on a whole new tangent, one that began with the Viking story back in #16, and just where it’s going to take them—well, even they’re not quite sure. But MAN-THING #20 will reveal more about the mysterious Scavenger; it’ll feature the return of Korrek and Jennifer to the strip; it may or may not concern someone named Dani; and it will definitely drop the Nightmare Box squarely in Marveldom’s collective lap. So be here. And meanwhile, let us know what you think of our new weirdness. The address is at the top of the page. And we read every letter. Again: Some of what was teased here would come to pass; some of it would not. In any case, Gerber and company extend the winning streak with “Scavenger.” I remember being genuinely shocked at the reveal of Scavenger’s handsome face the first time I read it, only to be still-further shocked at the scarring of that face via Man-Thing’s burning touch just one page later. In the wake of all of it, I couldn’t wait to discover what this guy’s story was. In addition, we also had the prospect of Richard Rory going to jail for kidnapping, which absolutely floored me, and the cherry on top of it all was the future of the Man-Thing—now that he was no longer tied to the swamp, where would he go? And the ending was so strangely, compellingly abrupt. Scavenger’s holding his now-scarred face in his hands while Man-Thing, Rory, and the others just look on… what the hell was going to happen in the following issue?? I actually got this issue when it was new on the racks at the Navy Exchange on the Treasure Island Naval Station in the San Francisco Bay where I lived in 1975. 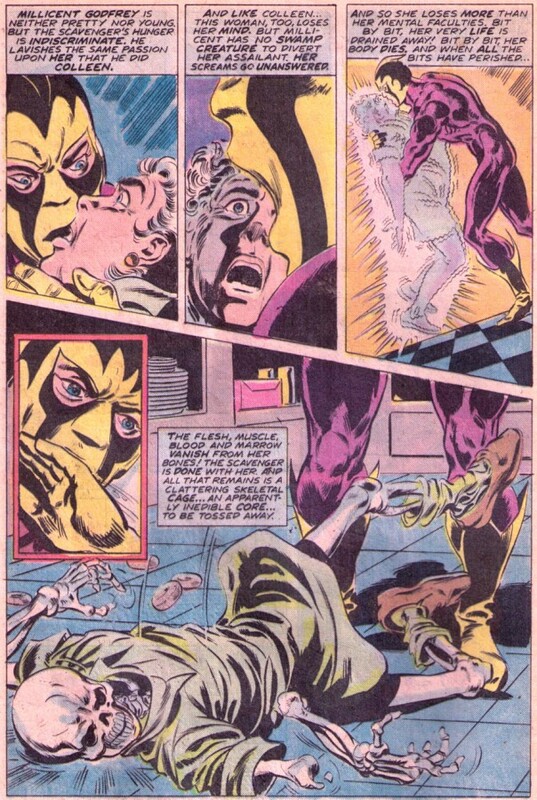 The Scavanger was one of the creepiest villains ever, a handsome devil whose kiss could destroy minds or kill people. And while this was my first introduction to Rory, he was definitely maintaining his bad luck streak here, even while trying to do good. Rather sad that Gerber wasn’t able to complete the story as he apparently initially planned it, but he had several unfinished stories, most famously in Omega the Unknown as well as his take on Guardians of the Galaxy, among others. If only we could check out those classics from Lucien’s library in Dream’s realm. Omega is my fave Gerber project and, imo, one of the greatest comics ever. Gerber was such a brilliant and unique voice– he is greatly missed.